Today is the first challenge of the new year for Little Red Wagon. Heather is in charge of this week's challenge and she thinks we should SPARKLE AND SHINE. And I agree!! 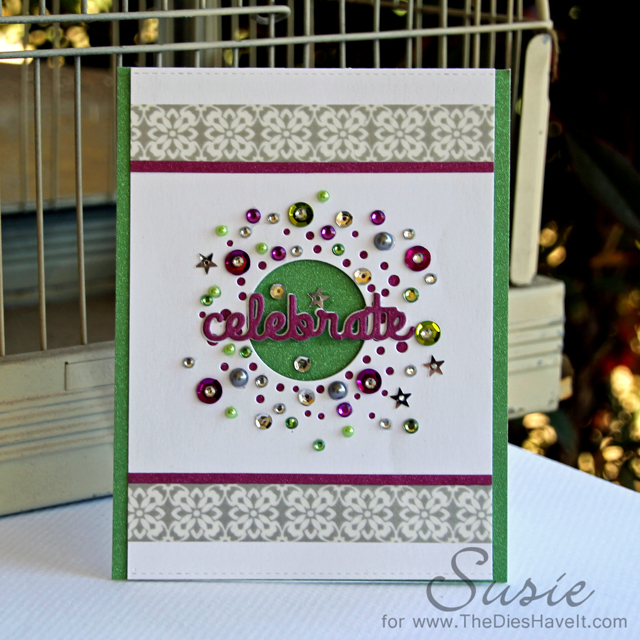 For my challenge card I started with green and magenta glitter papers and added lots of sparkle from there. Enamel dots, gems and sequins make this card super sparkly and fun. You can see Heather's card on the Little Red Wagon blog by clicking right here. Then be sure to check out what all the girlfriends have created for this challenge. The links are to the right (and then scroll down a little) of this post. What an awesome card!!! I love as the sparkle. Way to go!! Love how you incorporated the sparkle, Susie .. perfectly done. Welcome to the team. Sparkle - check, shine - check, fabulous and fun card - check! What a great example of a card that sure does Sparkle and Shine. I really like the addition of all those little bits. Welcome to the team. Hugs! !